AT THE HELM Francesco Torre on the Canneti patio with his rosemary focaccia and pork sausage sandwich. A few years ago, chef Francesco Torre posted his résumé on Craigslist. He was living in his native Tuscany at the time, cooking for some of the most prestigious hotels and wineries in the region. One day he got a call from William Foss, owner of Fish Restaurant in Sausalito. "He told me he wanted to fly out to Italy to meet me!" Torre, who opened Canneti Roadhouse Italiana in Forestville six months ago, recalls over the phone recently. "It was the funkiest thing that's ever happened in my life." His accent, rich as his food, throws me for a second. "Funniest thing?" Thrown by such an extravagant gesture, Torre offered to fly out to California instead. Though he wound up moving to Martinez a year later, it wasn't to work for Foss—at least, not yet. 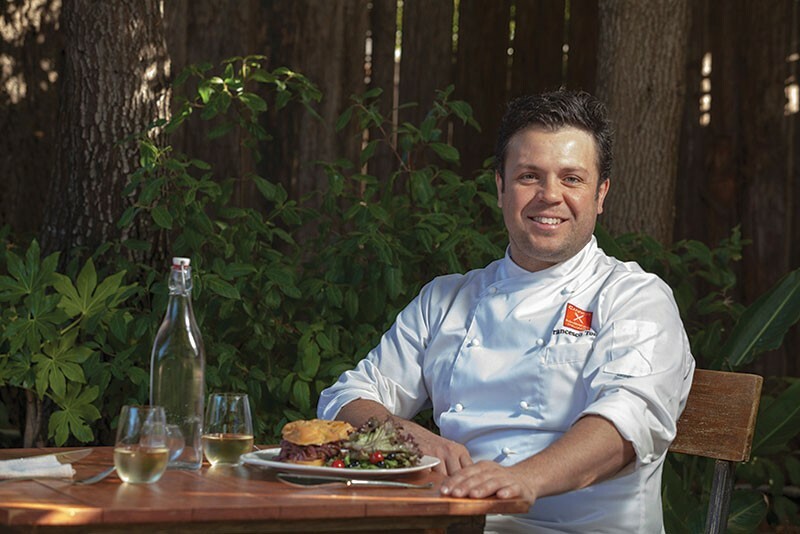 After commanding the kitchen at Tra Vigne Restaurant in Saint Helena, Torre became executive chef at Fish, where he deepened his commitment to sourcing local, sustainable ingredients. In fact, Torre is so serious about quality food that he almost left the industry years before because of the frozen mussels he'd been forced to serve at a touristy Italian hotel. "There were mussels right there on the beach!" he laments. When it came time to open his own restaurant, once again, Foss set him on his path. "Bill and I were driving down Highway 116 one day," he explains, "and we passed this ugly red building. It was literally falling apart." But when he peered into the lovely back garden (site of the former Mosaic), Torre, who restores old motorcycles in his spare time, knew he'd found the right fixer-upper. So he rewired the electrical, replaced the windows, exposed some of the original brick, and refinished the custom-made tables by local sculptor Jordy Morgan. The result is stunning. Named after the marshy weeds that grew on the road Torre used to walk to his elementary school, Canneti offers a host of different settings: there's a bright front room with a giant fireplace and open kitchen, a cozy wine nook laden with bottles for sale, an outdoor deck overhung with wisteria and, for optimum privacy, a handful of two-tops tucked under the fig trees. Given all this, you'd be right to expect Healdsburg prices, a misconception that Torre is eager to correct. Given that it's hard to describe his food without using superlatives, the prices are pleasantly surprising. In addition to lunch and dinner, Canneti offers a traditional Tuscan tasting menu and an Italian breakfast and brunch. The rosemary focaccia and pork sausage sandwich ($14) hits all the right notes. No dry mouthfuls here. The focaccia, dressed with braised red onions and Meyer lemon mayo, is soft and buttery, almost more like pastry than bread. The creamy, fresh shell pasta is adorned with a generous portion of smoked steelhead and sweet roasted shallots ($14). Bejeweled with fine sugar and served with a shot-glass of crème anglaise, even the usually pedestrian doughnut becomes a sublime dessert ($5). "My goal is not to become rich and famous," Torre laughs, "even though that would be great. But what I do for a living is to keep my guests happy." Canneti Roadhouse Italiana, 6675 Front. St., Forestville. 707.887.2232.